The New Jersey Community College Consortium is uniquely positioned to capitalize on the strengths of the state’s 19 community colleges in serving the workforce training needs of businesses and other private-sector employers. With the support of the NJ State Legislature, the Consortium’s initiatives and partnerships have met with unqualified success: More than 100,000 people were trained at over 5,400 companies by the 19 community colleges in the Consortium’s first ten years. This would not have been possible without the legislative and financial support of the state’s Governors, legislators and the NJ Department of Labor and Workforce Development. Created in the 1960s, the community colleges are the state’s largest provider of higher education services. But it was the passage of the Higher Education Restructuring Act of 1994 that dramatically enhanced the colleges’ ability to serve their communities. 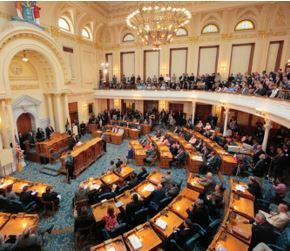 The Restructuring Act granted the colleges the autonomy to govern themselves in a coordinated fashion through the establishment of the New Jersey Council of County Colleges. The Council in 2004 set about to strengthen the colleges’ workforce training capacity by creating the New Jersey Community College Consortium for Workforce and Economic Development. The Consortium brings the training resources of the 19 community colleges under one roof for the benefit of the employer community. The Consortium coordinates the training and obtains government grants and other funding to pay for it. The most successful of these initiatives has been the NJBIA Basic Skills Workforce Training Program (also known as Employability Skills Training), established in partnership with the New Jersey Business & Industry Association and the NJ Department of Labor. Legislation passed in 2010 dedicates 13 percent of the state’s annual Supplemental Workforce Fund to the Consortium for this program.